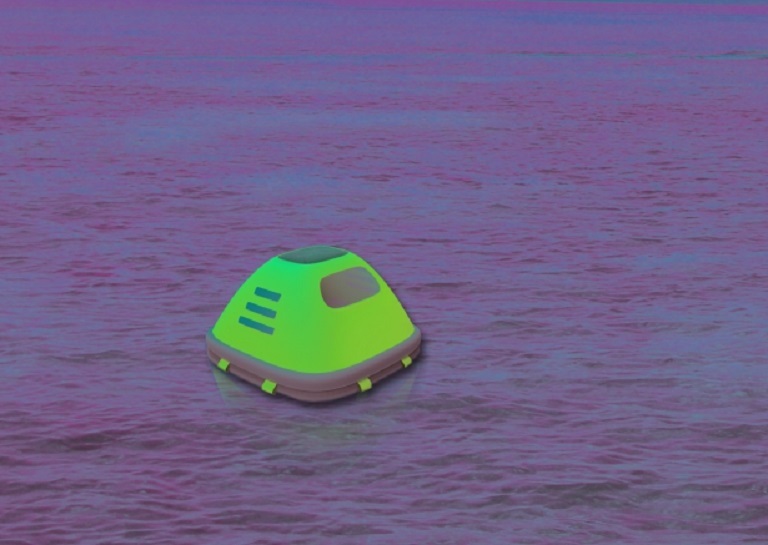 Rising sea levels and frequent natural calamities inspired designers Zhou Ying and Niu Yuntao to create the Duckweed Survival House, a floating emergency shelter designed to remain upright, continuously float and save lives during floods and tsunamis. The Duckweed Survival House is a floating emergency shelter designed to elevate survival rates and assist with rescues in disaster situations such as tsunamis and floods. An alternative to exposed life rafts, the enclosed design providers shelter from the elements and even large waves that have potential to overthrow or exhaust survivors. The weight underneath ensures the unit won’t tip over and is stabilizing in rough waters. The Duckweed Survival House, which won the 2015 Red Dot award, converts the seawater into fresh drinking water with a reverse osmosis film. Fresh air is supplied inside from the top of via an air vent. In case of an emergency, the shelter can be inflated in seconds with its built-in high-pressure carbon dioxide gas chamber. Individual shelters can be clustered together to increase stability, improve visibility and resist the effects of wind and waves. Fluorescent markers on the exterior allow rescuers to locate the shelters easily at night. In short, The Duckweed Survival House helps stranded people stay alive, hydrated and dry, while help is alerted. This Article (Chinese Designers Create Life-Saving Floating Survival House) is free and open source. You have permission to republish this article under a Creative Commons license with attribution to the author and AnonHQ.com.